As you are probably aware, next Sunday is the FOOTBALL Super Bowl. Our church will also have our S-O-U-P-E-R Bowl (of Caring). The Souper Bowl of Caring is a grassroots, faith-based crusade against hunger. Central’s youth are joining other churches, schools, organizations and individuals across the country to fight hunger and poverty by collecting dollars in soup pots next Sunday. 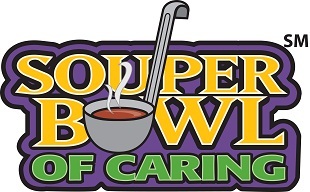 What is collected stays in the community to help fight hunger, but we report our total to the Souper Bowl of Caring headquarters so that they can come up with a grand total. All of the money we collect will benefit Neighbor to Neighbor. Last year we collected over $200! hunger organizations, denominational missions and other international ministries have also been recipients of Souper Bowl of Caring dollars. UPDATE: CPC Youth raised $109 for Neighbor to Neighbor! Thank You for your generosity!